What is WOW/Walking Wednesday/Fit Friday? With more students walking or wheeling (by bike, scooter or skateboard) to and from school, everyone benefits from less traffic during drop off and pick up times. And instead of sitting in a car, kids and families can spend quality time together getting in some of the 60 minutes of daily physical activity recommended for kids. Studies also show that students who walk to school arrive to school alert and ready to learn. So what are you waiting for? Grab a friend or family member and get walking and wheeling! A Walk or Wheel (WOW) Day is an ongoing, school-wide event your school can schedule weekly or monthly to encourage students to walk or wheel (by bike, scooter, or skateboard) to school. 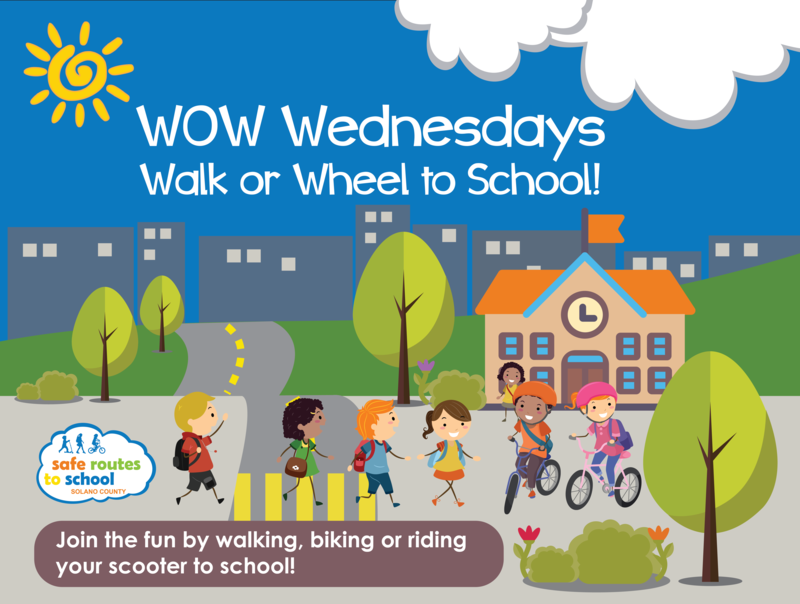 Schools can market the event as “Walk or Wheel (WOW) Day”, “Walking Wednesday”, or “Fit Friday”. Whatever you call it, it’s all good! Schools interested in promoting students’ physical activity can host a Walk or Wheel (WOW) Day to encourage students to walk, bike or ride their scooters to school on an ongoing basis. Schools choose a certain day of the week (such as WOW Wednesday) to promote a healthy and fun alternative to driving to school. The Safe Routes to School program can provide incentive items for participating students, as well as personalized promotional materials (such as fliers, banners and yard signs) to market the event at your school.